Earlier this month, stores across Japan offered "lucky bags" (福袋 or fukubukuro), which typically contain an array of items at a discounted price. In the past, you didn't know what the fukubukuro contained, but more recently, at many stores, you do. The Apple Store lucky bags are priced at 35,000 yen (around US$300) and come in nifty backpacks with special commemorative tags. At Apple Stores, you don't know what the lucky bag will contain, but as Togetter points out, a limited number of them had a MacBook Air as well as Beats Wireless and Apple TV, among other goodies, making the lucky bag a very, very good deal. Even if you don't get the laptop, the bag might have an iPad Air 2 or an iPad Mini 3 as the main prize. This year, the most "unlucky" of the bags come with an iPod Touch. It's a gamble, but that's why these folks in Sapporo, Japan, lined up January 1 in front of the Apple Store. The day started out optimistically enough, with a line of around eight people by about 4:30pm. The lucky bag was to go on sale January 2, so these folks planned to camp out over night. So much hope. So much optimism. Even if the temperature was -2 degrees celsius. Sapporo residents are certainly familiar to heavy snow and harsh winters, but still, sitting outside on the pavement in this weather is not for the faint of heart! 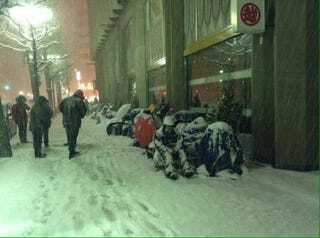 When it started snowing that evening, Apple Store employees did bring cans of hot corn soup to give out to those waiting in line. It got down to minus 8 degrees celsius. A security guard kept an eye on those waiting in line, presumably making sure everyone was alive, er, doing okay. Bundled up folks covered themselves with makeshift tents. As it got worse, some of those waiting joked on Twitter that waiting for the lucky bag might cost them their lives. I hope each and every one of these individuals got a Macbook Air. But they didn't. Here's the contents of one brave individual's lucky bag: an iPad Mini 3, among other items. This isn't a first. It snowed last year in Sapporo, too, when people lined up at the Apple Store, too. And next year, it will probably snow again. See you in 2016!